Product #6006 | SKU 3-066-0003 | 0.0 (no ratings yet) Thanks for your rating! The microFollowFocus | black is a new generation of follow focus units that lead the way in price/performance. The | black line incorporates new designs and technologies to deliver an incredibly solid, accurate, highly repeatable follow focus ideal for any level of production. The microFollowFocus | black can be used with still lenses (with proper gearing such as our microLensGears) and cinema lenses. The microFollowFocus | Black comes in two configurations: A single-sided version (Link to the single-sided version here) and a double-sided (studio) version. 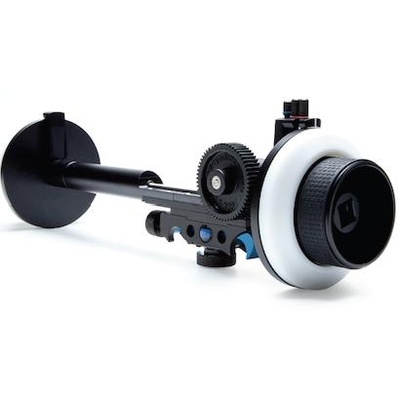 The only follow focus that allows you to add a second wheel on the opposite side which speeds up repositioning.